Plans for a new building had been considered as early as 1864, when the council decided to petition the Mother House for permission to build. We know that by December, 1864, the Mother House had approved designs for part of a new college building, and the site chosen for the new construction was approximately where Sorin Hall stands today. In a subsequent meeting, the council favored the idea of building where the Administration Building is today located. This, location they said, would be the safest, cheapest, and most convenient. It would make it possible to utilize a major part of the old building. Early in January, 1865, workers were busy gathering sand, lumber, bricks, and stone, so that all might be in readiness when school was dismissed in June. The building was to cost $35,500. It was to be 160 feet long, 80 feet wide, and 90 feet high. "It will be huge," writes Father Lemonnier in one of his letters, "but they like to build like that in the United States. They like big rooms, long, large, and high." An architect from Chicago, a Mr. Thomas, drew the plans. Of course most of the brick-masons, the carpenters, stone-cutters, plasterers, and teamsters were Brothers of Holy Cross. It would have been impossible to erect such a building without the economy made possible by the labor of the Brothers. They worked like beavers, and when school was out in June, they doubled their efforts. At this work they did not speak much. Their minds were occupied with the thing that was happening before their very eyes. Six stories high, and a beautiful dome! It made them gasp. A very accurate, but somewhat ornate, description of the new building is contained in "A Guide to the University of Notre Dame" published in 1865. It contains no photographs, but Father Lemonnier's facile hand drew some interesting pictures. The new structure was very box-like. It had none of the sweep and spread that characterizes the present Main Building. One mounted by stone steps to the porch that ran the entire length of the central portion of the edifice. The main entrance led to a corridor, seventeen feet wide, which ran to the back of the building and joined another corridor, at right angles, which led, on the east, to the large study hall of the Seniors, and on the west, to that of the Juniors. Below the study hall were the dining rooms for each division, and the kitchens. Even in those early days, the refectories were decorated by frescoes from the brush of Jacob Ackerman. They are not to be confused with the paintings that later adorned Brownson and Carroll refectories, although the artist was the same, frescoes to which the students, with pencil, added beards to bustled ladies. While in the refectories, advises the "Guide," the visitor should not fail to notice the "Tableaux d'Honneur." Twenty names, inscribed in gold, indicate the best mannered of Notre Dame's students; but such inscription did not necessarily imply, as we know from other accounts, an extensive knowledge of table etiquette. 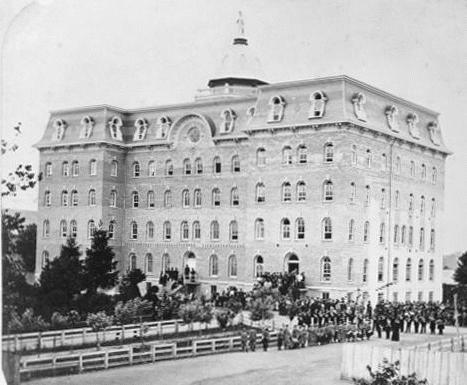 Classes were taught on the third floor. There were thirteen large class rooms at the back of the building. In the front there were five rooms for the professors. The Guide mentions that confusion from changing classes is avoided by the fact that students must march in silent ranks while going to and from the class rooms. As a matter of fact, it is only in the last generation that such a practice was abandoned. On the fourth and fifth floors were the dormitories, where each bed was neatly curtained off. On the fifth floor there was, also, a small chapel, where students liked to stop frequently for a short prayer. Then, there was the dome. Although the dome was not erected until the following year, the "Guide" of 1865 tells us what it is going to look like. A little balcony ran around the edge of the dome. The door leading to it was kept locked most of the time, but now and then some student got through and enjoyed the panorama. We know Tim O'Sullivan made it one 17th of March, about day-break, and before anyone could stop him, trumpeted "St. Patrick's Day in the Morning!" Father Sorin was very much chagrined. The morning of April 23, 1879, was refreshing. There was sun enough to be pleasantly warm. And from the lake to the west, a slight breeze was blowing. And it was Wednesday, a free day for the students. . . . And on this lazy April day, so dangerously close to spring fever epidemic, the air was unexpectedly rent with the sudden, shrill cry that rose from voices of the Minims -- they were the first to see it -- "Fire, fire! The college is on fire!" It was eleven o'clock. The flames were low on the college roof, close to the little railing that ran around the dome. Workmen had been on the roof as late as ten o'clock making some repairs. At that hour they had descended, locking the door behind them. If, when the fire was first detected, water in any quantity could have been brought to the roof, it would have been easily extinguished. But the building was six stories high; the buckets placed for just such an emergency were empty; and in the confusion that ensued precious time was lost. In ten or fifteen minutes the pitch roof began to blaze, sending forth clouds of dense smoke. . . . Within three hours the college building, St. Francis' Home, the Infirmary, and Music Hall were in complete ruin. . . . With extraordinary speed the ruins were cleared away. So promptly did everyone address himself to the work of rebuilding that the bricks and masonry were still hot while being hauled away. . . . By May 17th, Mr. W. J. Edbrooke, a Chicago architect, had submitted his plans for the new building. . . . Ground was broken on Saturday, May 17th. The first stone was placed on Monday, May 19th. It was estimated that 4,350,000 bricks were going into the new building. By June 21st the stone foundation for the front extension was in place, the window frames for the first story were up, and fifty-six bricklayers were engaged in work. On June 28th, the second story, its windows surmounted with caps of galvanized iron, was completed. The Fourth of July was celebrated by the completion of the third story. The record reads like an architectural marathon. Of course, that was a day innocent of labor disputes and delays. There was no eight-hour day, no forty-hour week. With this advantage, and with the three hundred workmen employed, the constant stream of stone that came by rail, the unbroken lines of wagons bringing brick from the kilns of South Bend and Bertrand, the all-out effort was magnificent. The building, with its countless angles and corners and jutting points of masonry, the numerous gables and turrets, the classic pillars that support the dome and statue, puzzles anyone who tries to classify it. The architect called it modern Gothic. The ground plan was a sort of fancy T-formation, the lower portion of which had an extension of 224 feet; the cross on the T spread 320 feet. At the intersection was a rotunda extending from the second floor clear to the dome. There had been a dome on the second college building, and Father Sorin was determined that there should be another on the present structure. . . . The University must have been disappointed when the fall session opened. Only 324 students enrolled. That counted everyone -- college students, preparatory students, and minims. Special care had been taken to finish the Infirmary, so that the students might be accommodated in case the college buildings were not finished. But by September, those fears were allayed. The college building was finished, and ready. -- Notre Dame -- One Hundred Years / by Arthur J. Hope, C.S.C.